Powder mix to prepare a clear, easy-to-cut instant glaze for all fruits, especially fruit flans. Sugar; Modified starch; Carrageenan; Locust bean gum; Trisodium citrate. 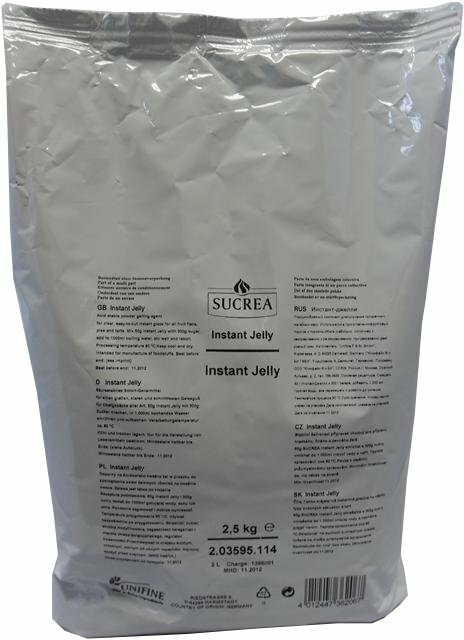 Ideal to prepare instant glaze for all fruit flans, pies and tarts. Mix 50g Instant Jelly with 300g sugar. Add to 1000ml boiling water, stir well and reboil.